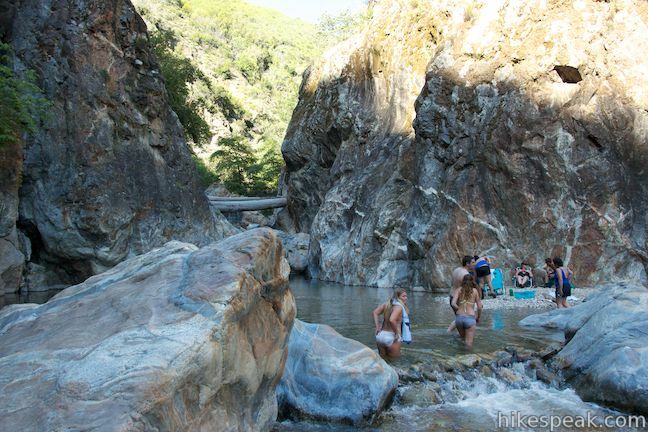 Big Sur River Gorge is one of the big draws at Pfeiffer Big Sur State Park, facilitating a romp to a swimming hole in the wilds of Big Sur. 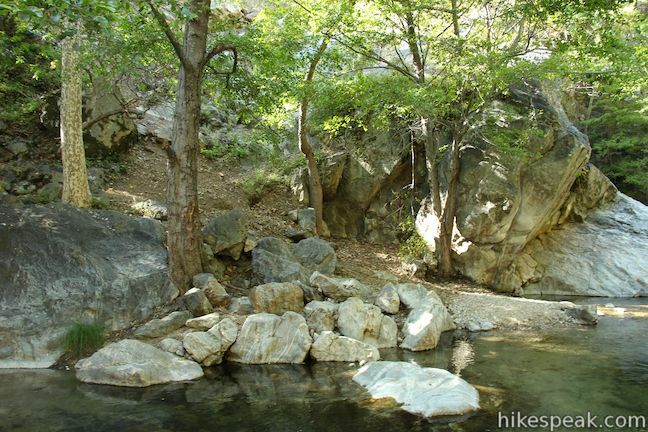 An unmaintained trail connects the park’s campground to a inviting pool of clear river water in a granite-walled gorge. 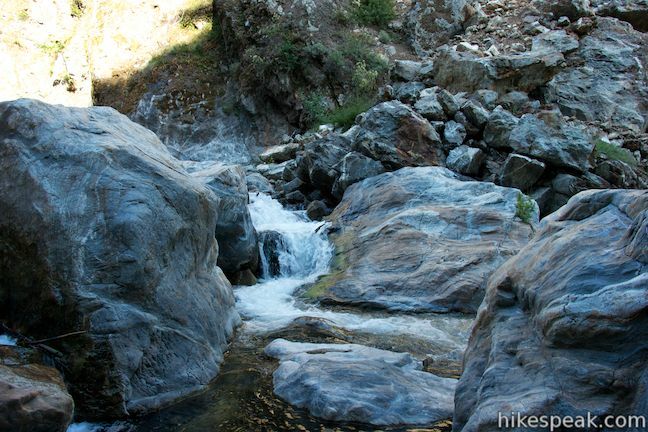 Multiple river crossings along the way make for a rock-hopping hike of half a mile round trip. 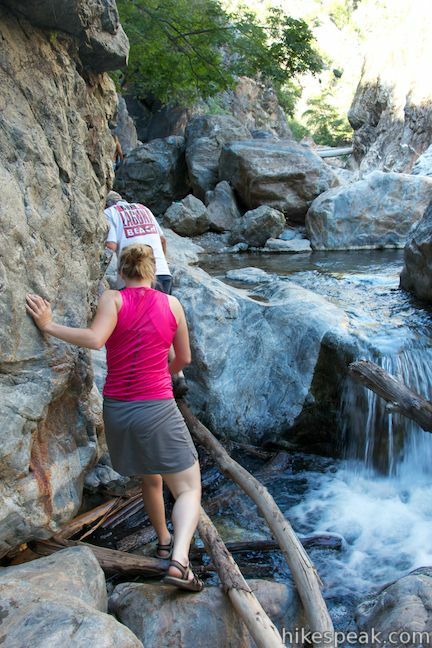 Persistent adventurers can continue above the swimming hole to more cascades, boulders, and pools in the Big Sur River Gorge. 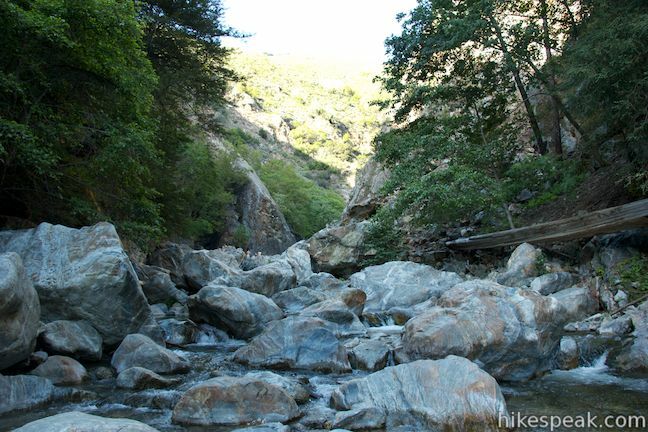 The trail to Big Sur River Gorge starts between sites 111 and 112 at the northeast end of Pfeiffer Big Sur State Park Campground. Those who are not staying at a campsite can begin from Day Use Lot 3 and set out up Gorge Trail. A note for those starting outside the campground, a bridge shown on park maps, connecting the Gorge Trail with the loop road at the northeast end of the campground, has been removed. 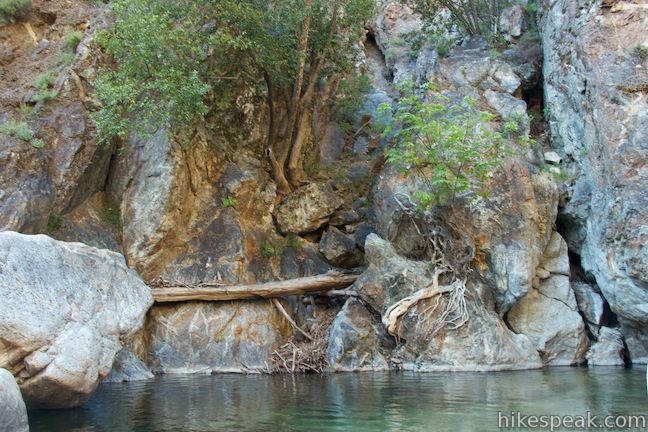 Hike past the old bridge abutments and continue along the left side of the river to reach the gorge. From the trailhead within the campground, things start off easy enough. 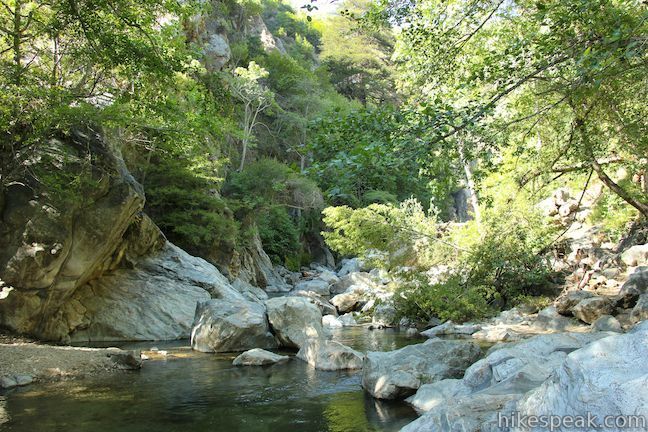 A wide trail leads up to the Big Sur River where the trail abruptly stops. Now the adventure begins. Only unmaintained paths perservere from this point on, allowing you to make your own way up the gorge. A route along the right side of the river goes much of the way. At one point, this path climbs about fifty feet above the water over boulders and fallen trees. Wade or boulder-hop across the river to the left bank when it feels appropriate. Another path goes along that shore. You will likely make your final approach to the pool from the left bank of the river. As long as you keep heading upstream, you will eventually reach the big pool (it’s not like you can take a wrong turn inside the gorge). After an agility-testing quarter mile, you will arrive at the pool that has made Big Sur River Gorge such a sought-after destination. 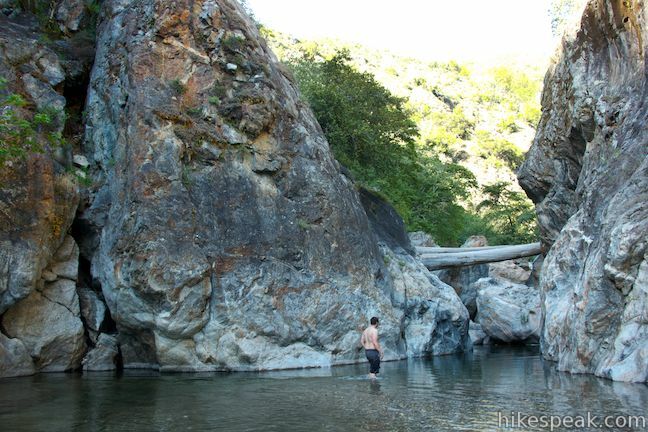 A shallow pool stretches across the gorge between steep granite walls. 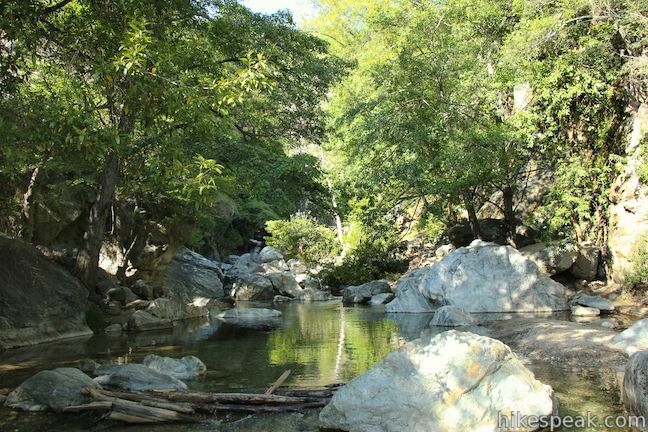 As recent as a couple years ago, the swimming hole was much deeper (and much more of a swimming hole). The pool has filled with sediment from a wildfire that shifted the land above the gorge. You’ll notice a suspended tree truck wedged between the rock walls at the back of the pool. The massive trunk came down when the river flooded with wildfire debris, illustrating how much the river was reshaped. To continue up the gorge, you’ll need to swim. 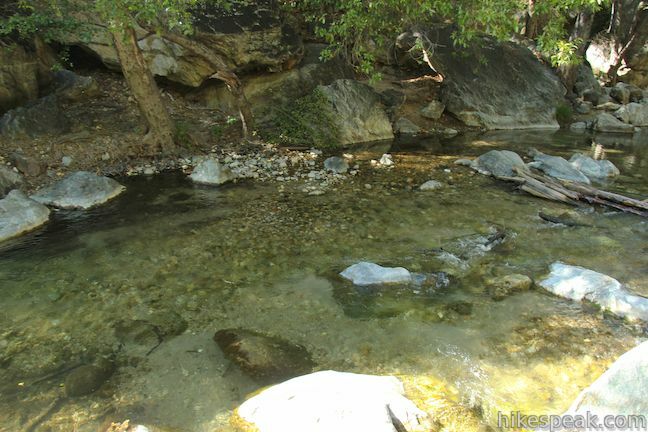 The water gets deep between the rock walls that pinch together at the top of the pool, so hop in and swim up the river. 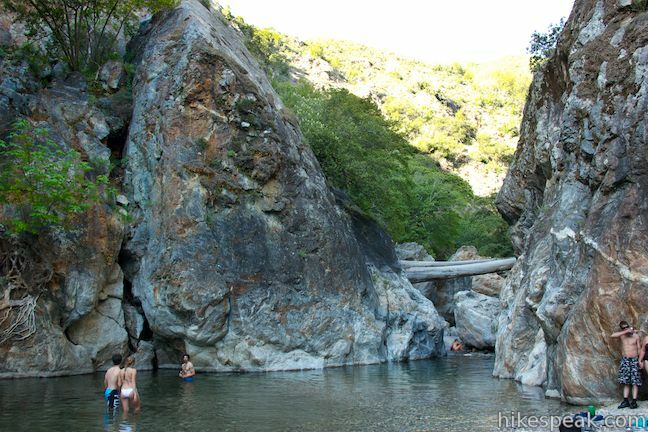 Climb out onto the rocks on the other side, where you’ll see the water split around massive boulders. There’s a short waterfall to the right and another cascade to the left. 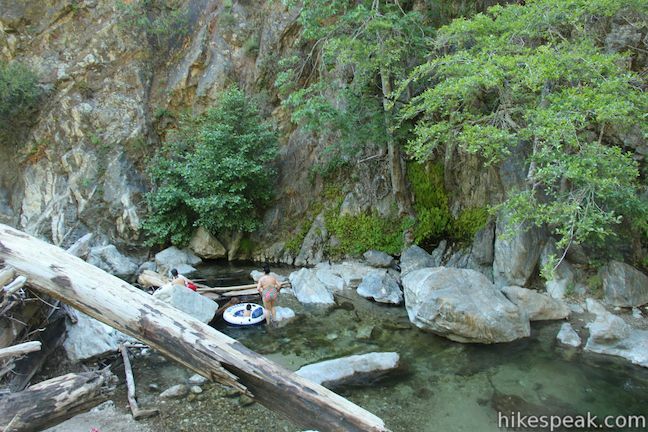 You can climb under and over logs and boulders if you want to continue up the Big Sur River and see what else the gorge has in store. This is a wild river and high water can make the gorge dangerous. 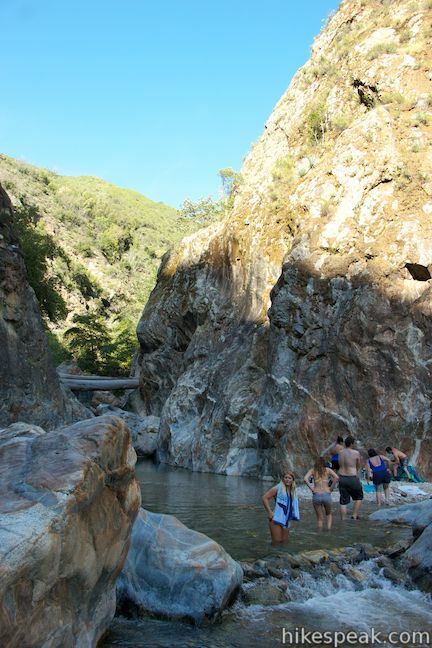 Diving off boulders and cliff jumping have risks too, so be safe as you explore the Big Sur River Gorge. Your safety is your responsibility. When the water gets too cold, warm up by sunbathing on the rocks around the pool. Don’t expect much privacy on summer weekends. This is a popular place to hang out and explore, and it’s easy to see why. 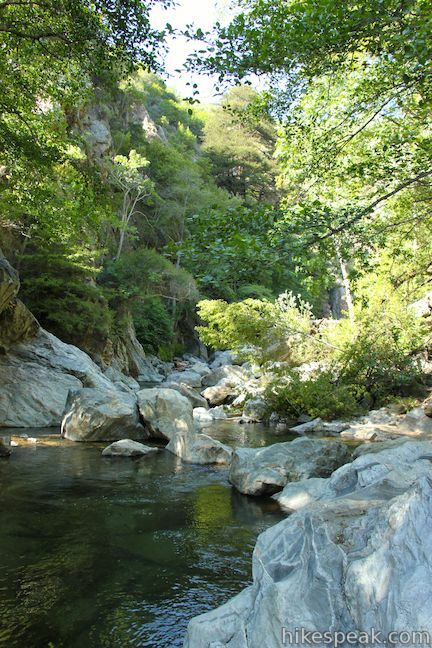 To borrow a phrase from Ithaca, New York… Big Sur is Gorges! 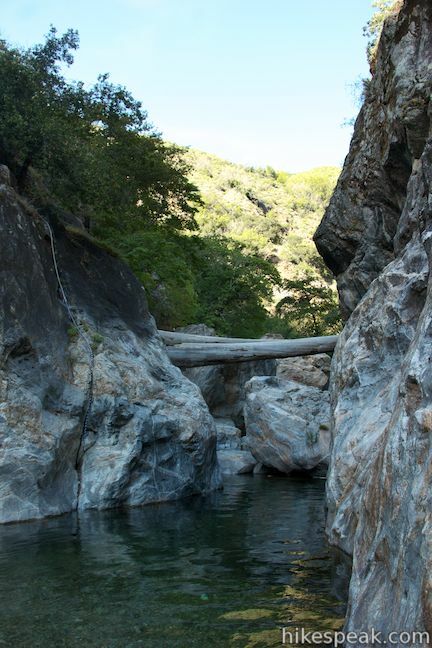 When you’re done at the swimming hole in Big Sur River Gorge, venture back the way you came, being careful as you climb over logs and wet boulders of smooth granite. 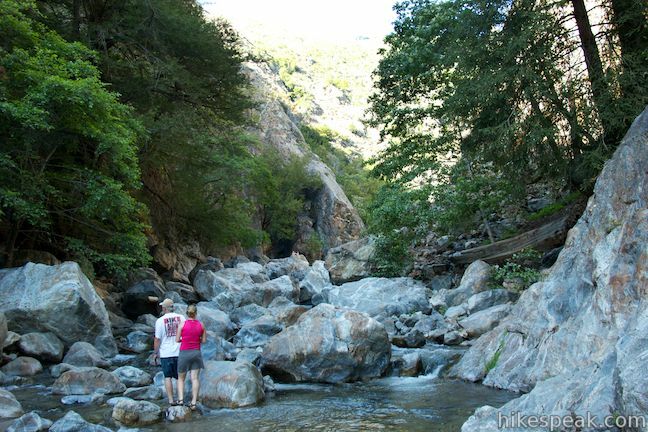 No permit is required to hike in the Big Sur River Gorge but an entrance fee ($10 day use fee or $35 to $50 camping fee) is required to access the trailheads in Pfeiffer Big Sur State Park (all prices as of 2016). Dogs and bikes are not permitted. Camping, campfires, fishing, and glass bottles are also prohibited in an effort to keep the gorge clean and safe. The park asks visitors not to move rocks or create dams that can hinder the steelhead fish that spawn in the river. 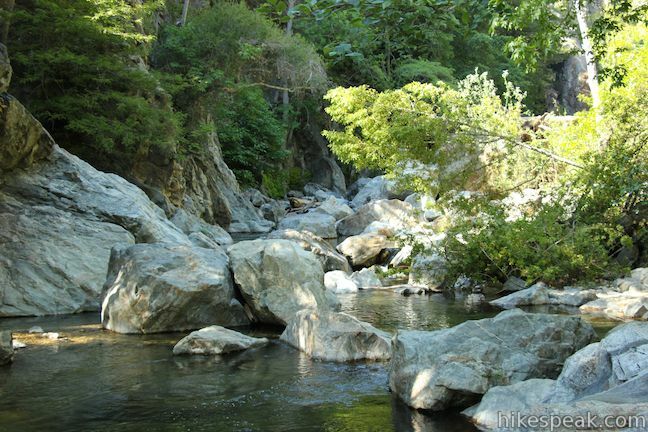 Clean up after yourself too, and help make Big Sur River Gorge an awesome place for everyone to visit. To get to the trailhead: From the south, drive up Highway One to the Pfeiffer Big Sur State Park entrance, located on the east side of the road, 11 miles north of Julia Pfeiffer Burns State Park and 2.9 miles north of Nepenth Restaurant. From the north, drive 4.4 miles south of Andrew Molera State Park and 0.7 miles past Fernwood Resort to reach the park entrance. The intersection with Pfeiffer Big Sur Road has signs for the lodge and the state park. Drive up the road through an intersection for the lodge and cabin sites to reach the entry station for Pfeiffer Big Sur State Park. 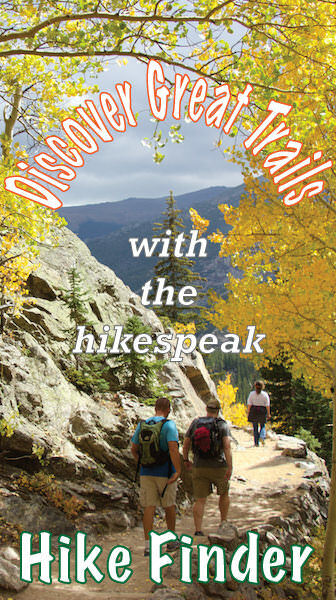 To get to the trailheads, pass the first two day use areas and come to an intersection in the road. Continue straight to reach Day Use Lot 3 and the start of Gorge Trail. 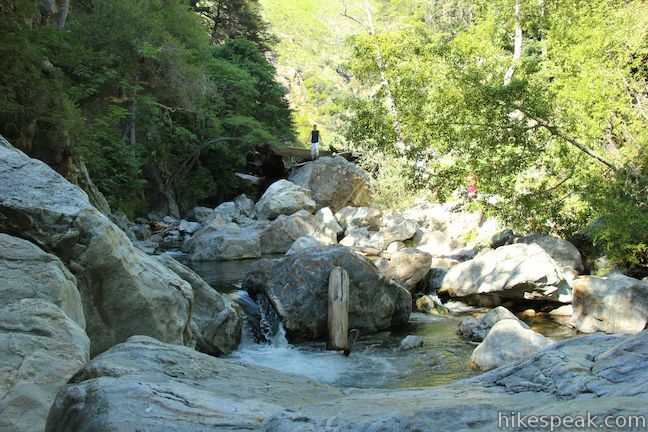 If you are camping, turn right and cross a bridge over the Big Sur River. 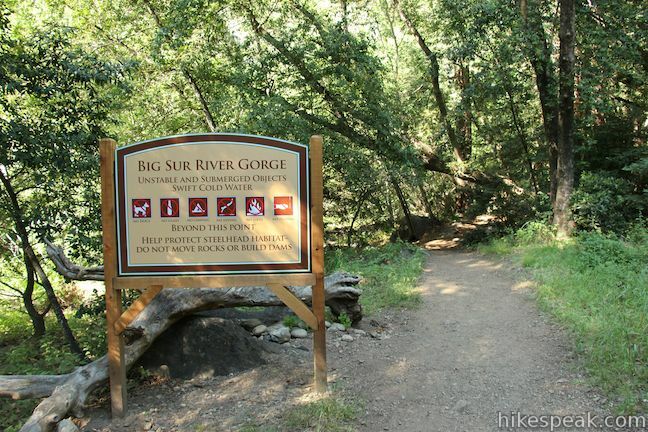 Turn left on the other side and go all the way to the end of the campground to find the beginning of the Big Sur River Gorge Trail between sites 111 and 112. There is no day use parking at this trailhead within the campground. This stunning hike of half a mile or more reaches two scenic overlooks as it descends to a long beach on the Big Sur coast. really sweet post ‘n pics! It would be great if the recommended campsite numbers were posted. Preferably the best river campsites.